How to Afford Homeschooling eBook - Look! We're Learning! We’ve been living frugally for quite some time, but when my husband was out of work, we took frugality to new heights. 🙂 As a homeschooling family, we’re already living on a reduced income, since I don’t work full-time. But we managed to stick with homeschooling using lots of effort, budgeting, and patience. We’re sharing some of these same tips with our new readers in our ebook “How to Afford Homeschooling!” And now you can grab your copy in our Store! Read on to see how to get yours! Plus – How to Find Great Homeschool Resources Absolutely Free! There’s even a section on how to have an honest talk about finances with your spouse, especially if he’s not convinced that your family can afford to homeschool. 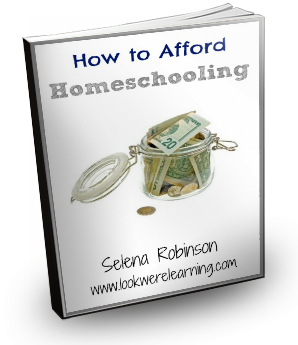 To get your copy of How to Afford Homeschooling, click the image or the link below to visit our Store! Isn’t that the truth! I’m a curriculum junkie, so I totally understand. Now I set a yearly budget and I stick to that. It’s helping a lot.